Facebook is removing age, gender and ZIP Code targeting for housing, employment, and credit-related ads. It will also impose a 15-mile minimum radius for geographic ad targeting for housing ads. The Facebook ad platform offers an unrivaled rich, diverse, and deep level of ad targeting options no other advertising platform can provide. These changes will not impact those agents and brokers that have been effectively using them to date and may reduce blatant discrimination. Why are ads on Facebook are so valuable? According to a recent study by Mediakix, the average person spends 35 minutes per day on Facebook giving agents and brokers the opportunity to put their ads in front of the right people. For years, Facebook has allowed advertisers to target potential customers based on their demographics and interests, including a treasure chest of data collected across Facebook properties (e.g. Facebook, Instagram, WhatsApp, etc.). 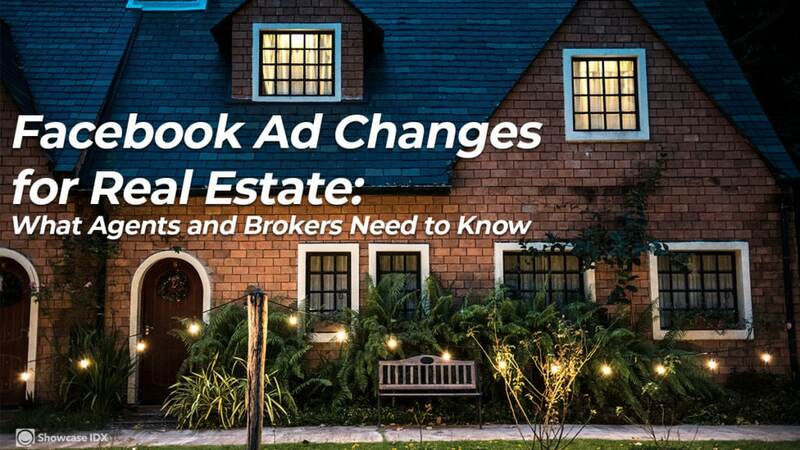 Why did Facebook make the change to ads targeting for real estate? There were accusations that landlords, lenders, and employers used Facebook to discriminate, a significant shift for a company that built a business empire on selling personal data. Facebook’s ad practices came under scrutiny after ProPublica published a series of articles showing how targeting options are used discriminate. Facebook began to look at the potential misuse and then several groups filed lawsuits. This week Facebook announced their decision as part of a settlement of five lawsuits filed by the National Fair Housing Alliance and others plaintiffs, which will also include just under $5 million in payments, according to the Wall Street Journal. What’s changing for real estate ads on Facebook? Facebook will be rolling out a complete overhaul to their ad targeting options for housing, loans, and job to remove many of the targeting options to prevent people and companies from discriminating against protected classes. They have already announced that they will remove the ability to target based on age, gender, ZIP Code and for radius less than 15 miles. The removal of targeting based on Zip Codes may create some extra work, but most successful real estate pros that used zipcodes were targeting much larger areas and simply uploading lists of many zip codes. If you were targeting based on a list of zip codes, you’ll need to rebuild your Facebook audiences and targeting for larger areas (e.g. counties, DMAs, map radiuses of more than 15 miles, etc). Facebook says it will also build a tool that can be used to view targeted housing ads, a move similar to a database the company built after controversy over targeted political ads. The changes on Facebook will roll out by the end of the year. Expect other ad platforms, like Google and Amazon, to make similar changes this year as well. What’s the impact for agents and brokers? Most Realtors and brokers will not see any impact from these changes. While it may create a little more work for those that used zipcodes, your goals and ROI will be similar. Overall, this is a win for fairness in housing. It is also a reminder to agents that advertising and social networks can (and will) change at any time. One of the most valuable assets you have is your personal brand. Make sure you have a strong website as the hub of your online presence and these changes will have a smaller impact on you in the future. Have you started using Facebook ads to drive traffic to your website or individual listings? What’s your experience been? Entrepreneurial marketing leader that’s built and run organizations from start-up to over $500M annual revenue. He brings a unique combination of storytelling and innovation to the team, having led marketing for many brands. Kurt’s a regular conference speaker and workshop leader around modern marketing tactics that actually drive sales. In addition, he has been asked to coach and advise thousands of leaders, from startup founders to the President of the United States. This is not a “win“. Just listed and Just sold ads are not appropriate for entire counties. Why is it OK to send direct mail to a specific area, but not target a Facebook ad to a specific area? Doesn’t make any sense to me. Great feedback, Stephanie. You’re right on the targeting of “just solds”. A 15-mile radius in most mid-sized or large cities would be too big as well. Depending on the size of local pages and interests, you may still be able to target at a smaller level. As an example, I live in Roswell, GA. You could target based on 1) the location Roswell, GA AND 2) the interest Roswell High School (or another page/landmark). From there, you can narrow further. It’s not precise but I’ve found that interest targeting like this is much more effective from an ROI perspective than simply location/age/etc targeting although I haven’t tried it for “just sold” ads. I do wonder what other common practices will not be possible or that may not be as effective.